Boil chicken till tender. Reserve 3 cups broth. Melt butter and mix with stuffing mix, sour cream and soup. Place half of stuffing mixture in a greased baking dish and lay chicken on top. 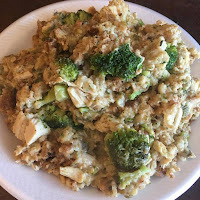 Distribute broccoli over all, then spoon remaining stuffing mixture over chicken. Pour 3 cups broth over all. Bake in a preheated 350° oven for 1 hour. *Notes: You may use cream of chicken soup instead of cream of mushroom. 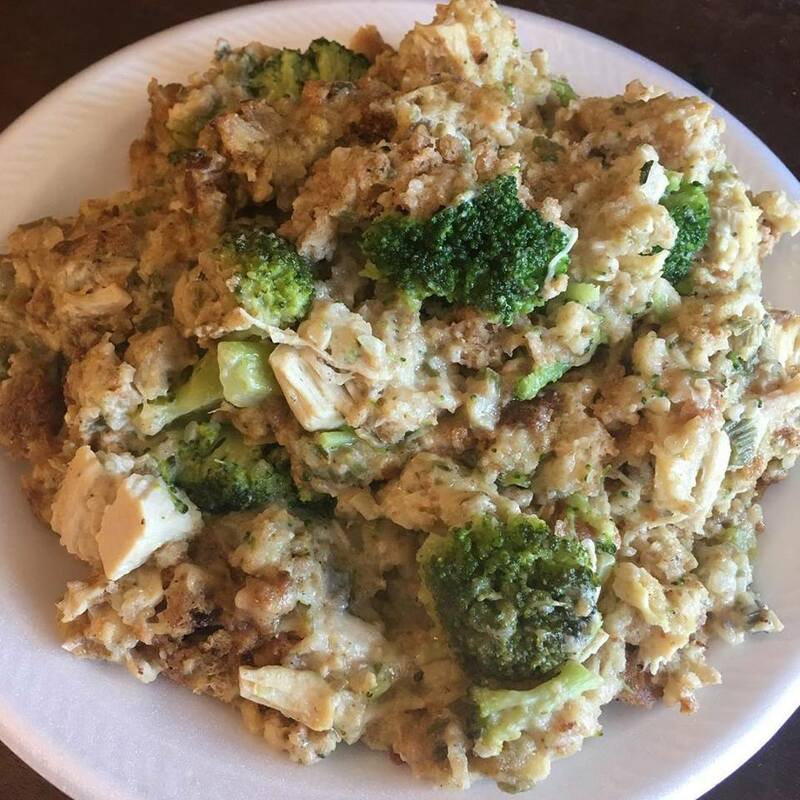 I sometimes chop the chicken breasts and add to the stuffing mixture instead of leaving them whole. Any flavor of stuffing mix may be used. Place eggs in a medium saucepan and just cover with cold water. Cover with lid and bring to a boil. Let boil for 5 minutes, then turn off heat, leaving pan on the burner. Let set for 15 minutes, then place pan in sink, remove lid and run cold water over eggs till just cool enough to handle. Pour off all but an inch or so of water, add a cup of ice cubes, and cover with lid. Holding lid with one hand and pot handle with the other, shake pan vigorously in all directions to crack egg shells. Remove lid. Remove any remaining egg shells under running cold water. I find with this method many times the eggs are nearly totally clean of shells and need very little shelling. Dice eggs into a flat bottomed bowl and then use a potato masher to mash eggs to your preferred consistency. Add mayonnaise and salt and pepper to your taste and mix well. Recipe may be increased. Refrigerate any leftovers. If you like deviled eggs, you may like deviled egg salad. Just add mustard to taste, 1 tablespoon white vinegar and 1-2 tablespoons sugar to the above mixture and mix well. Line a 13x9 baking dish or pan with foil. Set aside. With a serrated knife, slice all the rolls in half so the bottoms and tops are equal height. Place the bottoms in the prepared pan and spread mayonnaise on 6 of the bottoms and horseradish sauce on the other 6. You may use mustard if you like instead of or in addition to the mayo and horseradish. Divide the ham evenly and place on 6 of the rolls spread with mayo. Do the same with the roast beef, placing the roast beef onto the rolls spread with horseradish. Cut each cheese slice into quarters and place 4 quarters onto each sandwich. Spread the remaining roll tops with mayo and horseradish and top the ham rolls with the mayo tops and the roast beef rolls with horseradish spread tops. Melt the stick of butter in a small microwave safe bowl in the microwave just until melted. Add the Worcestershire sauce, poppy seeds and garlic powder and mix well. Pour evenly over the sandwiches and cover with another piece of foil. Place in 350* oven for 15 minutes. Remove foil and bake until tops are toasty, middles are hot and cheese is melted. Serve piping hot. 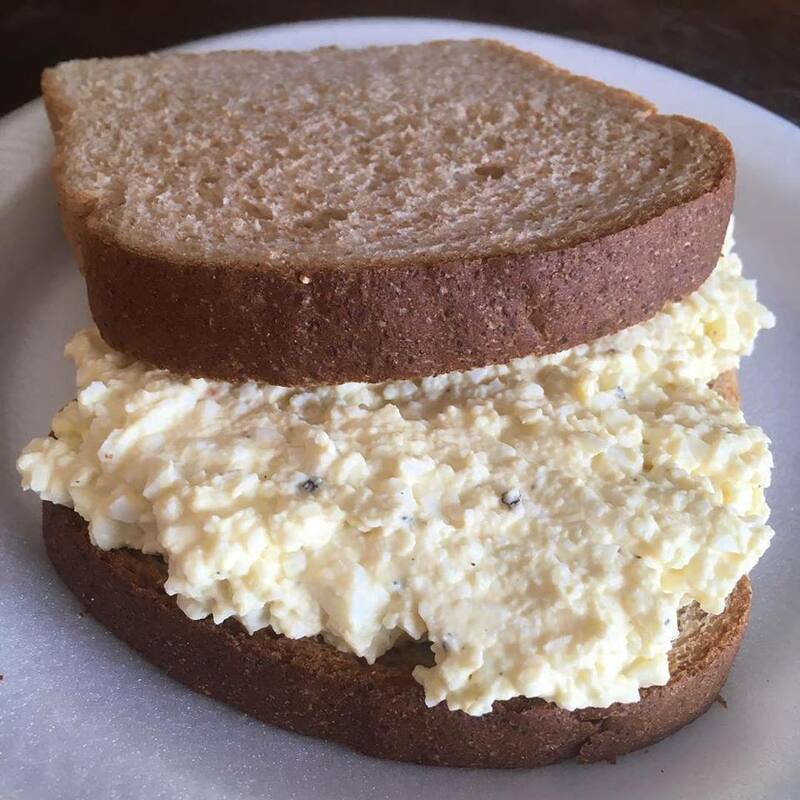 You can customize these sandwiches by using regular dinner rolls, different lunch meats and sandwich spreads or mustards and different cheeses. Some people like to make these ahead of time and let them marinate in the melted butter. I've seen recipes that range from 4 hours ahead to overnight. I usually just make them and bake them right then. 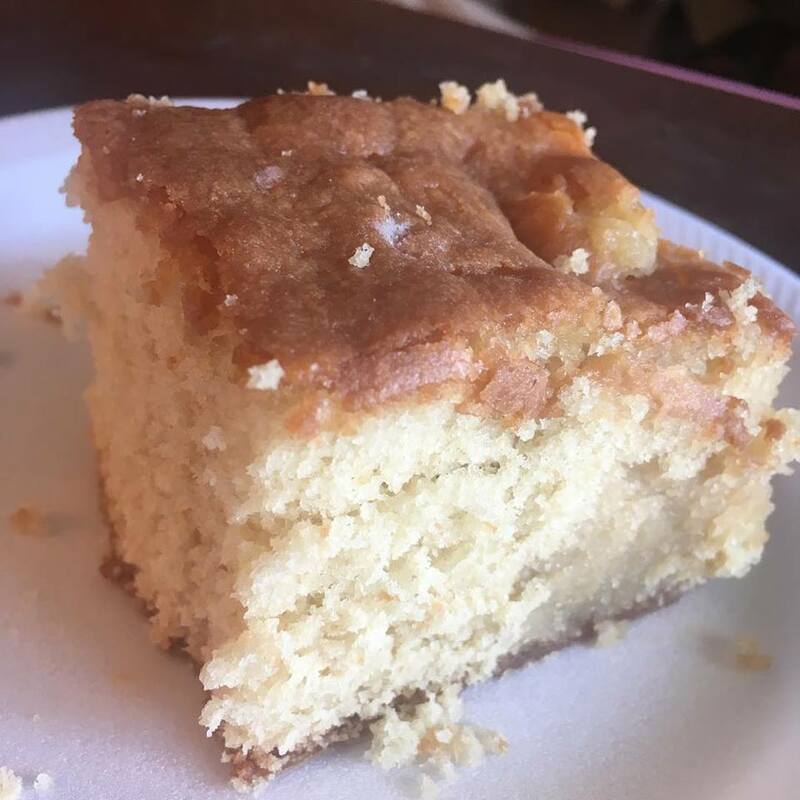 The story behind the name is that apparently this recipe originated with the Amish or Pennsylvania Dutch, and they began making these to take to funeral wakes for the bereaved families, but your guess is as good as anyone's whether this is fact or just a legend. Prepare a 13x9 baking dish or pan by coating with butter or cooking spray. Set aside. Peel and dice potatoes. Place prepared potatoes and diced onion in a skillet with the oil and fry on medium heat until browned and done, stirring often. Add green chilies and stir to combine. Remove from heat. Add half the potato mixture to the prepared baking pan. Distribute cheese over potatoes, then add remainder of the potato mixture to the pan, spreading evenly. Beat eggs with milk and pour over potato mixture, adding salt and pepper to taste. Cover with foil and bake at 350* for 30 minutes. Remove foil and bake until browned on top and just set in the center, 20-30 minutes longer. 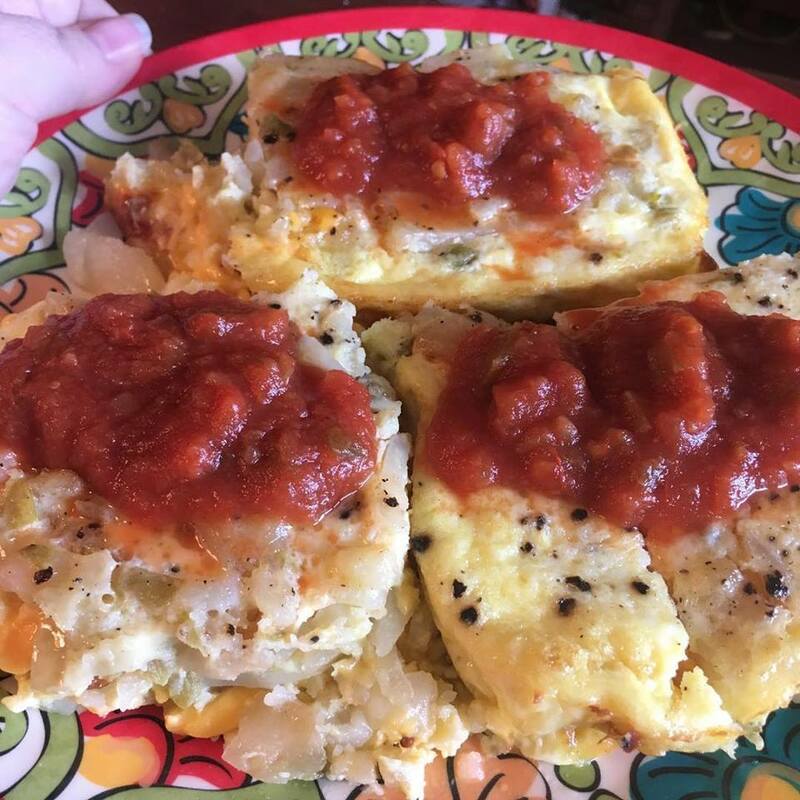 Serve piping hot, topped with salsa if desired. You may use thawed frozen hash browns or O'Brien potatoes or thawed tater tots, but they will need to be cooked as described above. You may add diced ham, cooked and crumbled breakfast sausage, sausage links, or sliced polish sausage. 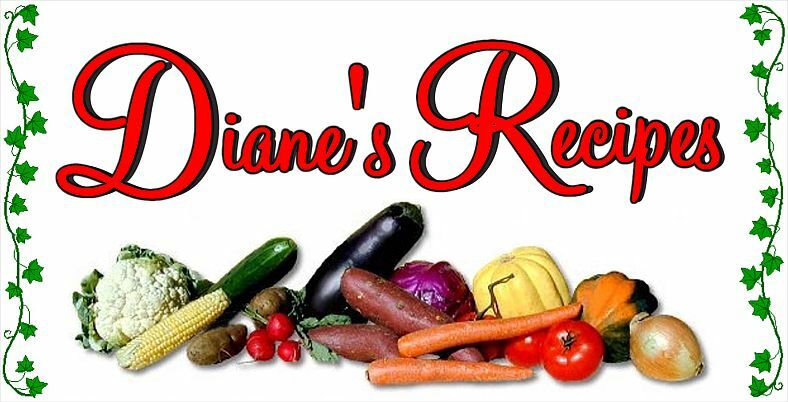 You may add 1/2 cup diced bell pepper or jalapeno peppers to the raw potatoes before frying. You may add a package of frozen spinach, thawed and squeezed dry before adding to the potato mixture at the same time the green chilies are added. You may use shredded cheese instead of Velveeta. Pepper jack is especially good in this, but any variety of cheddar, Gruyere, Swiss, Provolone, Parmesan or even mozzarella are also great in this. This freezes well. Remove from oven when still a little jiggly in the center and cool completely. I prepare it in disposable aluminum pans, and wrap tightly in 2 layers of aluminum foil. Thaw in the fridge and leave the foil on, then reheat in a 350* oven until heated through, about 20-25 minutes. There are infinite variations for this dish to make it your own and discover new favorites. Generously grease or spray with cooking oil spray a 13x9 baking dish or pan. 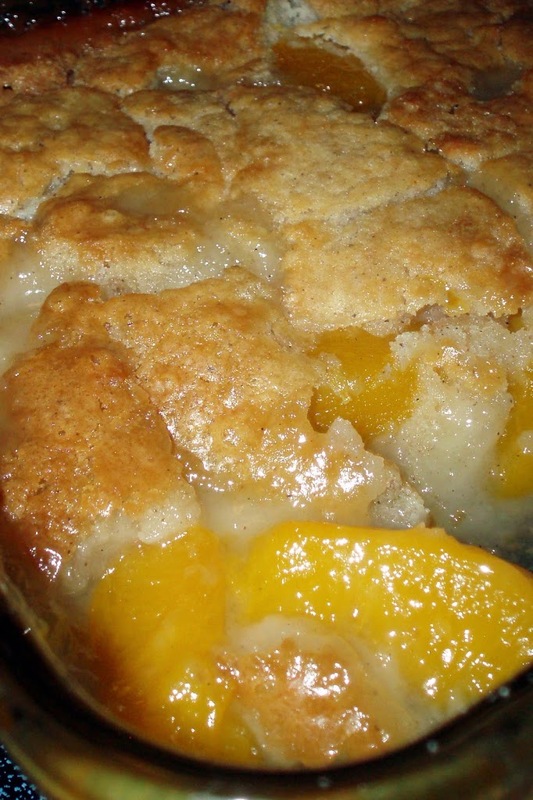 Pour peaches and juice into pan and distribute the peach slices evenly. Set aside. In a medium sized bowl, mix sugar, milk, flour and vanilla. Stir till well combined and then pour over peaches in baking dish. This will be very runny, but don't panic, it will be fine. Dot the top with the butter and place in oven. Bake until golden brown, about 45 minutes. Some of the batter will be puffy and brown and some will still be a little gooey. This is part of this cobbler's charm. Cool a bit on a wire rack. I suggest serving it still warm with a scoop of vanilla ice cream. Grease a 10 inch Bundt pan with butter or shortening very liberally. Dust the pan with flour and set aside. then increase the speed to medium and mix for 3 minutes. until a toothpick entered into the center comes out clean. glaze evenly on the cake while still in the pan. cake onto a serving plate. so there's more to soak into the cake. In a large Dutch oven or soup pot, place chicken, bouillon, bay leaves, black pepper and water. Cover and bring to a boil. Lower heat and simmer for 1 hour or until tender. Remove chicken from pot and let cool. Skin and debone the chicken and chop or tear into bite sized pieces. Set aside. In the meantime, add onion, carrot and celery to the hot broth. Cover and bring back to a boil. Lower heat and simmer for about 15 minutes, or until vegetables are nearly tender. Return to a boil and add noodles. Cook over medium heat until noodles are tender. Add the prepared chicken and thyme if using, and taste to adjust seasonings. Add more salt and pepper now if desired. Remove bay leaves. Just before serving stir in parsley flakes. *You may use frozen egg noodles if you wish, just cook in the broth as directed on the package. I have even used spaghetti noodles, elbows and other small pasta when I didn't have egg noodles on hand. A variation that we like occasionally: withhold a cup of the water when you cook the chicken, and add a 12 oz. 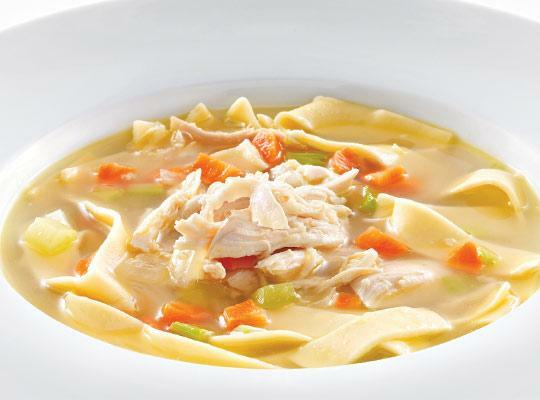 can of evaporated milk (such as Pet milk or Carnation) when you add the cooked chicken to the pot for creamy chicken noodle soup. In a glass baking dish, place cream cheese and butter. Microwave on high until melted and just bubbling. Stir well to combine. Add remaining ingredients and stir well. Place in oven and bake for 30-35 mins or until hot and bubbly. *Note: you may use mild, regular or hot green chilies, your choice. Check Out My Main Blog! © Diane Jennings 2006, 2007, 2008, 2009 & 2010. All rights reserved. Republication or redistribution of content, text or image is strictly prohibited without prior written consent.